As the official equipment of the Para-Spartan Elite, GRIT is committed to helping adaptive athletes conquer Spartan Races. Both GRIT and Spartan are fueled by the rigor, determination, and no-excuse drive of riders and competitors. Just like members of the GRIT rider community, no Spartan ever goes it alone. GRIT and Spartan are working together to make these races possible for athletes of all ability levels, one lever stroke at a time. Read on to learn more and get involved! Spartan Chairs are also decked out in Spartan swag, so there can be no doubt that riders of this chair are, indeed, Spartans. Want to see the Spartan Chair? Considering a Spartan Chair of your own? Click below to view details on this model. Do you have what it takes to be a Spartan PARA Elite Racer? Do you want to learn about the sport of obstacle racing as it refers to adaptive athletes? Want expert advice from staff, coaches, athletes and trainers on how to get through the course? Sign up today for any Para Elite Training Heat at any of the locations in the 2019 Honor Series (full list at right) and Spartan will do the rest! We just need you to show up. Each Para Elite training event will offer a Mobility and Flexibility guided warm-up where athletes will get to know one another, review some of the basic rules of the Spartan Para Elite event and talk equipment, gear and the sport in general; in addition, athletes will participate in a fully supported heat with the same staff, trainers, athletes and coaches to support and guide getting each racer through the course. Athletes will be able to engage obstacles with other Para Elites and learn about approach, safety and techniques while going at a manageable pace as a team. Think of it as a learning event designed to get new athletes to the sport comfortable while giving existing athletes the time and space to improve techniques, share methods and meet other competitors. Interested in how your Para team can qualify for Spartan Para Elite Nationals or Spartan Para Elite Worlds? Click here to learn more. A very limited number of GRIT Freedom Chairs are available to borrow, and all athletes who need one must request it through registration immediately. Please review the event locations and dates at right, and fill out the form below. Spartan Races have been around since 2007, but the first Para Spartan Elite Race was held on Laughlin, NV, in November 2018. The race featured nine teams of adaptive athletes competing in teams of four. 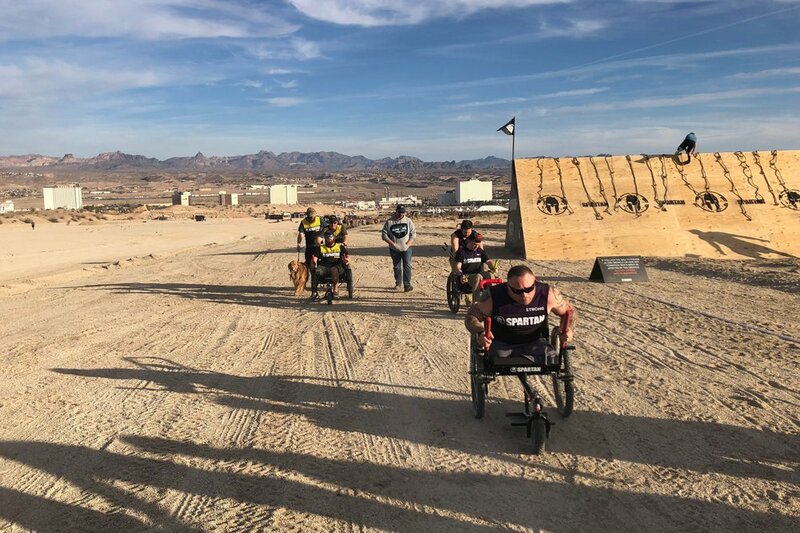 The course they raced on was the standard Spartan Sprint course, featuring twenty obstacles and 4.78 miles of grueling desert terrain. Most teams used Spartan Chairs to complete the race. The winning team, Team Some Assembly Required (Joe Fonseca, Trevor Battah, Jeremy Ogle, Caitlin Conner) was awarded the grand prize of $10,000. You can read about Caitlin Conner’s experience in this race, here.